Teachers and support staff in schools come in contact with youth every day. Youth may be suffering in silence, and thinking about running away. They may be the victims of bullying, abuse or difficulties at home. They may be close to leaving home. However, with the proper training, education professionals can recognize the signs and implement lessons that encourage at-risk youth to be empowered to make decisions that will keep them safe and off the street. 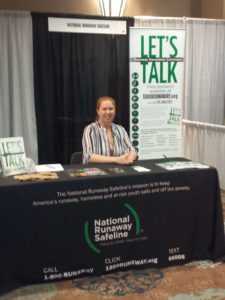 National Runaway Safeline (NRS) does its best to provide that training, either on-site or at conferences around the country. Lindsey Kahney, our runaway prevention specialist, is regularly traveling the country to speak at conferences about our “Let’s Talk: Runaway Prevention Curriculum.” Her latest appearance was at the 2017 National Conference on Bullying in Orlando. This presentation is based on “Communication & Listening,” the first module in the 14-module “Let’s Talk: Runaway Prevention Curriculum.” The basis of crisis intervention for youth is to be able to listen to youth in need. The module instructs us to listen with empathy and find the common themes in their words. The module also includes instructions on how to communicate during a crisis. Our entire runaway prevention curriculum is available for download in English and in a Spanish version. Our training and education department is also available for on-site training. For information, please email Lindsey at lkahney@1800RUNAWAY.org. If you work with youth at risk of running away, this curriculum can help your program immensely. For instructors and teachers who were not able to attend her latest presentation, we have added Lindsey’s presentation to our Slideshare account and within this post. This is available for download below.